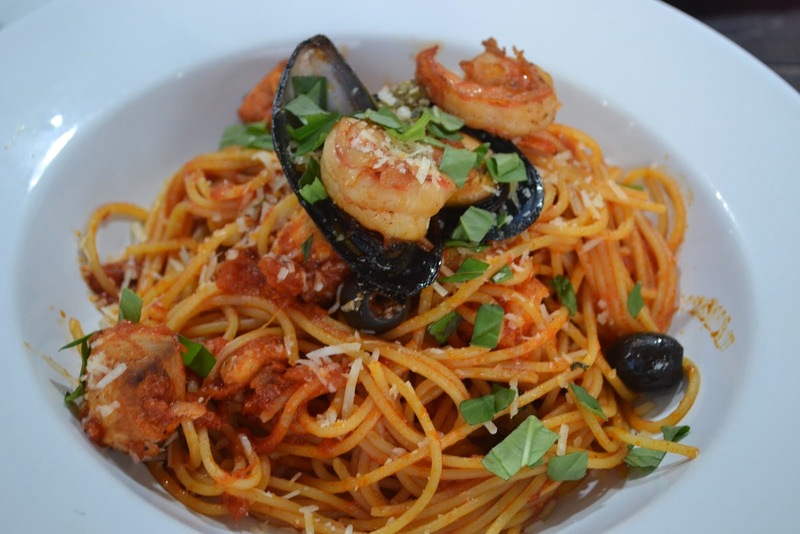 More Than Just A SAHM: So Yummy, SOYAMI! I was invited last Saturday for a Nutritious and Delicious Cooking Lesson held at SM City Annex, Active Fun, featuring healthy recipes of SOYAMI. Because I am an avid Soyami fan, since the day I discovered the many benefits of this chips, I said yes right away! Being a mom, I only want what's best for my kids especially for their baon at school. The recipes included healthy and easy-to-prepare snack for kids. 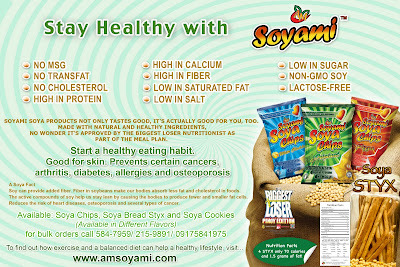 When I found out the many benefits of Soyami, I always make it a point to include it in our grocery cart. What a healthy chips in a bag! It is made of Real Soya, No Transfat, No MSG but you won't feel like eating a Soya. Pinoy Biggest Loser Nutritionist, Nadine Tengco, presented us the many recipes like Sneaky Tuna Nuggets, Mac n' Cheese (with Soyami Pizza) and Smoothies which I will post in my other blogs separately so I can share it also to other moms for healthy snacks and meals for their kids. Here's more of the SOYAMI. Young adults are known for living on a diet of fast food, junk food, sodas and alcohol. Body image issues and self-esteem are influential in what and how they eat. Pulling in all-nighters of heavy partying and drinking on a regular basis are high on their list of priorities for reasons of acceptance and fitting in with their peers. They abuse their bodies in all the wrong sense, thinking that their ripe, young age is a VIP pass which permits them to do anything as they please. Sadly, being young does not make you immune to the risks of having an unfit and dangerous lifestyle. Consumption of too much cholesterol, Trans fat and sodium can lead to a lot of chronic diseases and many complications later on. That’s why healthy eating is important to good health. If we are what we eat, then it only makes sense that we put fresh and natural foods into our bodies. And it does not have to be difficult at all. It’s not much of a big sacrifice when changes in your diet can be as simple as choosing a healthier substitute or alternative over your favorite but unhealthy indulgences. It’s all about making positive changes in your lifestyle that will result to a healthier you. Take your usual chips, for example. Young adults consume a bag of chips excessively despite its nasty reputation for being classified as junk food. 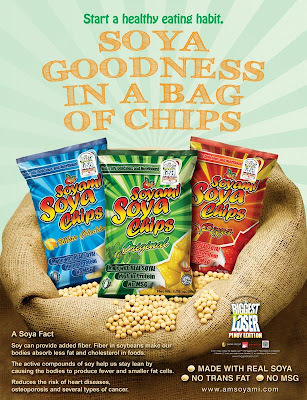 But Soyami Soya Chips turns things around by creating soy chips that are good for our bodies. 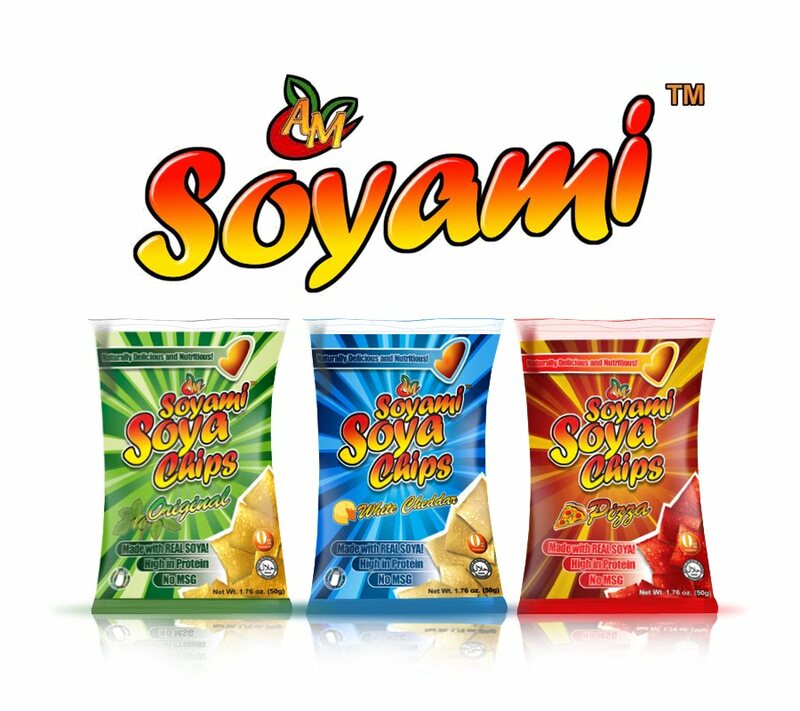 Soyami Soya Chips is finally getting snacking right by using a wholesome, natural ingredient and combining it with a lip-smacking flavor, young adults will love. It’s a healthy yet flavorful alternative to enjoy chips without junk food’s harmful effects. 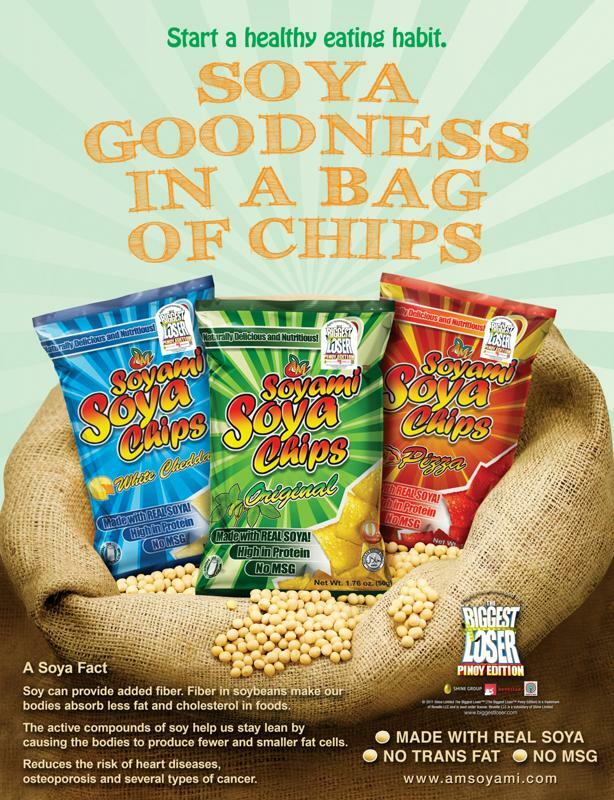 High in protein and fiber, Soyami Soya chips is a perfectly light snack that’s deliciously low in fat, sodium and calories. It’s made from 100% real soya. No MSG. No Trans fat. Non-GMO. 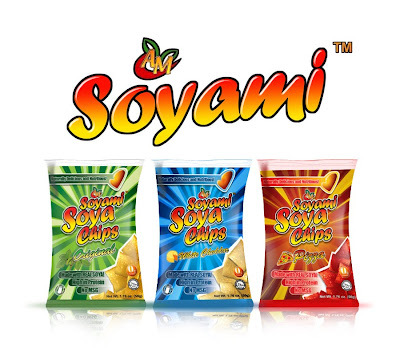 Try the three exciting flavors- Soyami Soya Chips Original, Pizza and White Cheddar. To view more photos, please click HERE! Yummy Soyami! My favorite flavor is white cheddar. hmmm.. haven't tried it yet, but we will, eventually, lol! by the way, do you mind checking out on The Life and Adventures of A Sack? Sa pangalan pa lang, yummy na!